Cologne - The opening weekend of the Bundesliga season - 14-16 August - is drawing ever nearer, with the 18 top-flight clubs using all the spare time they can find to dust off the summer cobwebs before they return to competitive action. And with that, we'll take our leave for the evening. Hope you've enjoyed our coverage today as the Bundesliga's return moves one day closer. If you fancy some bedtime reading, we've got some great stuff from Pep Guardiola over here and an insight into Max Kruse's arrival at VfL Wolfsburg here. Just like Schalke, we'll be back bright and early to keep you up to date with all that's moving and shaking in German football. Bis Morgen! They may have been victorious tonight, but Andre Breitenreiter's Schalke troops will be back at it bright and early tomorrow. Many happy returns to Stuttgart star Alexandru Maxim. Last but not least, FC Ingolstadt have beaten VfR Aalen in Großmehring thanks to goals from Pascal Groß, KLukas Hinterseer and Tomas Pekhart. Schalke, meanwhile, have beaten Austria Klagenfurt 3-1. Translation: 90' That's it! Our friendly against @chur97live ends 6-0. VfL Wolfsburg summer signing Max Kruse has arrived at the Wolves' team hotel in Bad Ragaz. The former Borussia Mönchengladbach frontman will be officially unveiled as a VfL player on Thursday. 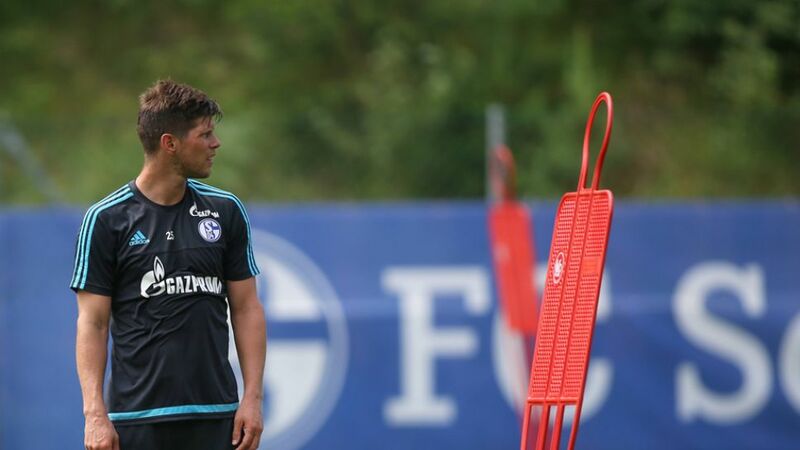 FC Schalke 04 are taking on Austria Klagenfurt in a pre-season friendly this evening. We'll bring you the results from all of tonight's friendly encounters as soon as they come in. Gladbach centre-half Alvaro Dominguez is hard at work to repeat the successes of 2014/15 this time out. Shinji Kagawa is seemingly as popular in Singapore as he is in Japan. Although it does look quite the view. Ilkay Gündogan, Shinji Kagawa and Co look to be enjoying themselves in Singapore. It might be hard work, but it does look like the Argentinian is enjoying it! You can watch the Royal Blues' arrival for their first pre-season friendly on the club's periscope account. "The Argentinian Pablo De Blasis has changed his shirt number and will wear the number 32," reads this tweet from Mainz. Pierre-Emerick Aubemeyang is enjoying his food alongside BVB new boys Julian Weigl and Roman Bürki. You can find out the time and dates of the first seven Matchdays right here. "Straight from holiday into the gym! Welcome back to Mathew Leckie!" reads this tweet from FC Ingolstadt. Werder Bremen's stars are back at training and raring to go. Many happy returns to Bremen left-back Santiago Garcia. The club have tweeted some great photos from the Royal Blues' final training session before tonight's friendly against SK Austria Klagenfurt. Don't forget, you can find kick-off times until the end of September, released earlier today, here. The Augsburg boys look to be having fun at their Bundesliga media day today. "My first goal of the season," club goalkeeper Marwin Hitz has tweeted with the video below. A nice haul for new 1. FC Köln striker Anthony Modeste. Happy 23rd Birthday to one of the Bundesliga's finest atttackers, Heung-Min Son! Thiago Alcantara posed for photos with fans after Bayern's training session this morning. After checking in at their Singapore hotel, Marcel Schmelzer (r.), Sokratis and Co will be taking to the pitch shortly. Borussia Dortmund have touched down in the city-state of Singapore for part II of their Bundesliga World Tour 2015 where the Westphalia club received a warm welcome indeed from the local Black-Yellows faithful! VfB Stuttgart were able to welcome back Geoffroy Serey Die to training on Wednesday. The Ivorian international, who so impressed in the club's successful relegation escape at the end of the last season, was granted an extended summer break following his participation in the African Cup of Nations in January and February. "First training session for Serey Die with his team-mates," reads this tweet. Here's a colourful tribute to FC Bayern and Germany goalkeeping great Manuel Neuer. The Royal Blues will have a chance to put what they've been learning in training into practice against SK Austria Klagenfurt tonight.